Mr. Stephanopoulos will contribute to various programs, but at the outset he will appear most often as a political analyst on This Week, the Sunday morning news program with Cokie Roberts and Sam Donaldson as co-hosts. 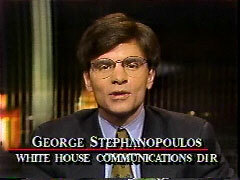 Eventually Mr. Stephanopoulos is expected to do some reporting as a correspondent, the network said. The overnight transformation of George Stephanopoulos from partisan pitchman to television journalist highlights a disturbing phenomenon: the progressive collapse of the walls that traditionally separated news from propaganda. Self-respecting news organizations used to pride themselves on the sturdy barriers they maintained to guard against all kinds of partisan contamination....[Stephanopoulos's] case shows how no one even bothers any longer to decontaminate a convert (like, say, Bill Moyers) by stretching out his passage from politics to reporting over a cleansing period of time. Working against Reagan's budget [in 1981] made me a Democrat. I didn't think supply-side economics would work, and I didn't believe it was fair. Perhaps it wouldn't have happened had I had a different summer job, but unlike the millions of Democrats whom Reagan inspired to vote Republican, I was a Republican he pushed the other way. Over the past 13 years, ABC has maneuvered Stephanopoulos from liberal pundit to political analyst for Good Morning America to chief Washington correspondent, anchor of This Week on Sunday mornings. The ascent continued in 2009. 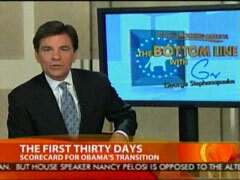 On December 14 of that year, Stephanopoulos became the new co-host of Good Morning America. "This might have been the most emotional speech I've seen President Obama give. He was right on the edge of anger, it seemed at times, especially when he was rebutting some of the charges made about his plan. And I don't think I've ever seen him get caught up emotionally in the way he did in those final couple of paragraphs, where there was even a catch in his voice — not even in his Inaugural Address back in January. This is very close to President Obama's heart." — ABC's George Stephanopoulos following Obama's health care speech, September 9, 2009. 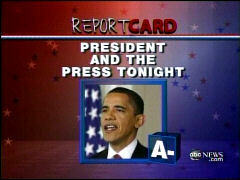 — ABC's Stephanopoulos grading President Obama's press conference on Good Morning America, March 25, 2009. 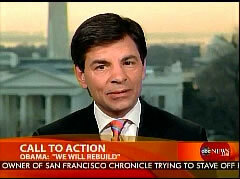 — Stephanopoulos on Nightline following Obama's press conference, March 24, 2009. "You would have to say his number one accomplishment has been to inspire a sense of confidence in the country....That confidence, that optimism, not only gives President Obama a political cushion, but it could have a real world economic impact." — Stephanopoulos talking about Obama's first 100 days on World News, April 29, 2009. "[President Obama] came right out of the box and said, 'make no mistake about it, we are going to recover.' That's the most important thing he wanted the country to hear last night. He began on hope. He ended on hope. Now, in between, there's a lot of hard things to be done....But I think he made a start at inspiring hope out in the country." — Stephanopoulos rating President Obama's first speech to Congress, Good Morning America, February 25, 2009. Fill-in anchor Diane Sawyer: "Today they [the White House] released some photos, a kind of scrapbook, if you will, of the President's journey on the road to the stimulus package. I want to show everybody at home, because there is the President, it's Super Bowl night, and he's serving cookies to congressional leadership in the White House screening room, George?" 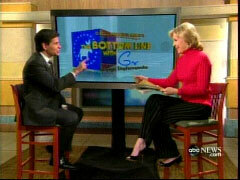 George Stephanopoulos: "These are just remarkable, Diane. We've never really seen anything like this before in real time." "He got an A on this, Terry....He had the long answers, five-minute mini-essays or speeches all about the economy, able to explain from his perspective how bad the situation is, how we got into this mess and how his stimulus package will fix it." — Stephanopoulos critiquing Obama's first press conference, February 9, 2009 Nightline. "That pick really seems to have been the political master stroke that got President Obama out of the tight box he was in." — Stephanopoulos discussing the announcement that Barack Obama was replacing General Stanley McChrystal with David Petraeus, ABC's Good Morning America, June 24, 2010. — ABC's World News, January 23, 2009. Co-host Diane Sawyer: 'Speaking of the President-elect, kind of an anniversary today, 30 days since he was elected. So, it's time to launch the first annual, ever, 30-day George Stephanopoulos presidential election awards....What are the headlines to you? — ABC's Good Morning America, December 4, 2008. — ABC's George Stephanopoulos on Nightline, September 26, 2008, declaring Barack Obama the winner of his debate with John McCain earlier that night. — ABC's Nightline following the vice presidential debate, October 3, 2008. 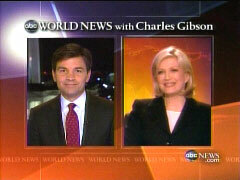 — ABC's George Stephanopoulos grading the presidential debate on Nightline, October 7, 2008. "He won tonight by staying cool under pressure. He won tonight by parrying the attacks of John McCain. The only thing that John McCain could have really done tonight to change the tenor of this campaign was to get under Obama's skin, to force him into an error. That did not happen tonight. 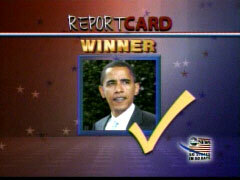 Another win for Barack Obama." — Stephanopoulos on ABC's Nightline after the final debate, October 15, 2008. — ABC's George Stephanopoulos moments after Rudy Giuliani's speech to the Republican convention, September 3, 2008. — Exchange on the July 27, 2008 edition of ABC's This Week. — ABC's Good Morning America, February 1, 2008. — ABC's George Stephanopoulos, a top official in Bill Clinton's first presidential campaign and first administration, on Good Morning America, June 3, 2008. Touting Obama's "Act of Honor"
— ABC's George Stephanopoulos discussing Obama's speech on race relations, March 18, 2008 World News. — ABC's George Stephanopoulos assessing Obama's speech on race relations, Good Morning America, March 19, 2008. — ABC's Good Morning America, February 21, 2008, a few hours after a front-page New York Times story suggested McCain had a 'romantic' relationship with a female lobbyist but presented no evidence for the charge. — ABC's Good Morning America, December 14,2009. — ABC's George Stephanopoulos to Governor Tim Pawlenty (R-MN) on This Week, June 29, 2008. Stephanopoulos did not identify the Tax Policy Center as a joint project of two liberal think tanks, the Brookings Institution and the Urban Institute. — ABC's George Stephanopoulos to Democratic presidential candidate Tom Vilsack on This Week, December 3, 2006. — George Stephanopoulos to conservative Stephen Laffey, who was challenging liberal Lincoln Chafee in Rhode Island's GOP Senate primary, ABC's This Week, September 3, 2006. — ABC's This Week, September 18, 2005. – ABC's George Stephanopoulos to former Treasury Secretary Robert Rubin on This Week, November 16, 2003. "Untrue" Hits on Kerry, Dukakis? — ABC's George Stephanopoulos on Good Morning America, June 13, 2008. Feel Bad About Hounding Clinton? — Stephanopoulos beginning ABC's This Week, Sept. 11, 2005. — ABC's This Week, June 5, 2005. 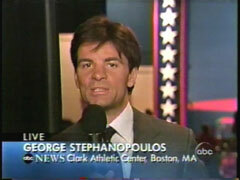 – ABC's George Stephanopoulos during live coverage immediately following the September 30, 2004 debate. Rather's Forgery Scandal a GOP Conspiracy? – ABC's George Stephanopoulos on Good Morning America September 2, 2004 recounting the Republican convention speeches from the night before. 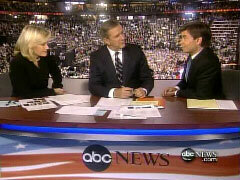 – George Stephanopoulos during ABC's live coverage, September 1, 2004. Thrilled By Kerry's "Blistering Attack"
— ABC's George Stephanopoulos during live coverage right after John Kerry's speech to the Democratic convention, July 29, 2004. — Exchange on Good Morning America, July 30, 2004. Bush's the Most Vengeful White House Ever? — ABC's Good Morning America, March 23, 2004. — Then-Clinton advisor George Stephanopoulos on ABC's This Week on June 30, 1996, attacking FBI agent Gary Aldrich for writing a book critical of the White House. — ABC's This Week, December 21, 2003. Democrats Deal With Their Adulterers? Anchor Charles Gibson: "We've had a lot of governors and senators with these kinds of problems, personal indiscretions. Governors Spitzer, McGreevey, Blagojevich of Illinois, now Sanford, and Senators Craig, Vitter, and Ensign. There's a lot of them." George Stephanopoulos: "Boy, there sure are. But one remarkable fact, Charlie, you look at the breakdown, on the Democratic side, Spitzer, McGreevey, you add the Detroit Mayor, Kilpatrick, all of the politicians were forced out of office. Everyone of the Republicans you just mentioned held on." — ABC's World News, June 24, 2009. — George Stephanopoulos on ABC's This Week, Aug. 3, 2003, interviewing Libyan dictator Moammar Qaddafi, sponsor of several anti-American terrorist attacks in the 1980s. — George Stephanopoulos to White House Communications Director Dan Bartlett on ABC's This Week, August 18, 2002. 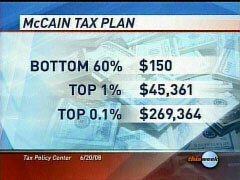 The items Stephanopoulos cited totaled $523 million, or just one–tenth of the total spending package. — George Stephanopoulos on This Week, November 12, 2000. — ABC political analyst George Stephanopoulos, October 3, 2000 post-debate coverage. — Stephanopoulos on Nightline, same night. — ABC analyst George Stephanopoulos, February 20, 2000 This Week. — ABC political analyst George Stephanopoulos minutes after the State of the Union speech, January 27, 2000. David Pomerantz, high school friend: "George is incredibly smart." Alexandra Wentworth, wife: "Incredibly smart." Nancy Brunswick, former high school teacher: "Intellectual." James Carville, Democratic operative: "I once said, 'If you converted his IQ to Fahrenheit, you could boil water.'"